Only you stand in the way of Namibia’s illegal poaching activities! 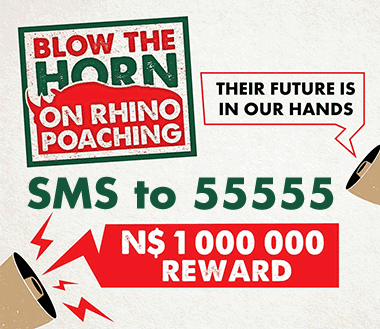 Help save our rhino, a tip-off that leads to prosecution and conviction of a poacher will earn you a share of the N$1 million reward. Report any poaching activities on the ISAP mobile app or send an SMS to 555 55 with your name, location and details of the incident. It’s time to blow the horn on rhino poaching! ISAP has taken over the official monitoring of the Ministry of Environment & Tourism's 555 55 SMS number. SOURCE - Person providing information on Rhino poaching, Rhino horn smuggling / trade, to ISAP. CANDIDATE - Means person who has provided information, (Through the indicated CHANNELS to ISAP), on Rhino poaching, Rhino horn trade or possession, Rhino horn smuggling syndicates or any illegal activity associated with the trade, killing of Rhino’s, which has led to a formal investigation by the AUTHORITIES. REWARD - N$ 250 000.00 per successful candidate. RECIPIENT - Successful CANDIDATE receiving REWARD. 1. Report information to ISAP through correct CHANNELS. Information must be as detailed as possible! 2. Notification of information received, will be sent to SOURCE. 3. Information will be screened & prioritised by ISAP, based on detail, accuracy, validity and provision of “useable” evidence. 4. Relavent information will then be passed onto AUTHORITIES for investigation and follow up. 5. Should information provided by SOURCE be used in a formal investigation, by the AUTHORITIES, then the SOURCE will become known as a CANDIDATE. 6. CANDIDATE will be notified that their information is being used in a investigation and will be kept informed of progress, as and when determined by the AUTHORITIES. 7. Upon arrest, successful conviction and sentencing of a poacher / syndicate / smuggler, the CANDIDATE will become a RECIPIENT of the reward. 8. Payment of REWARD will become due to RECIPIENT on final written approval from the AUTHORITIES. * Any false, misleading or irrelevant information, provided by a SOURCE ,will result in the SOURCE becoming blacklisted. Blacklisted numbers will barred from future participation. * Reporting CHANNELS are CONFIDENTIAL, thereby providing protection of any SOURCE’s personal detail.